Barbour Sett Crew Neck Jumper. This 100% Lambswool jumper would be an excellent addition to any winter wardrobe. 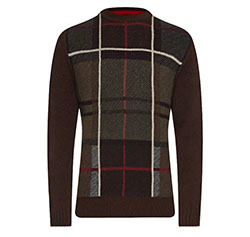 A good quality, medium weight sweater, with an exclusive large scale Classic Tartan design. Olive side tab with Gold Barbour branding to left side seam. Back length: 26.25 - 28.75 inches (67-73 cms). 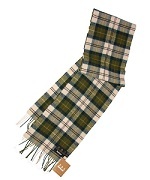 Available in Dark Brown with large scale tartan front panel. The Barbour Sett Crew Neck Jumper is part of the Barbour Classic Tartan Range.